A New Way To Learn DevOps! We’re really excited to announce that James Wickett and I (Ernest Mueller) from The Agile Admin have put together a comprehensive DevOps Fundamentals course for lynda.com – a 3 hour long course covering everything from DevOps’ Agile and Lean roots, to DevOps culture to book recommendations and we even cover future . As you know we here at The Agile Admin have spent a lot of time trying to help people learn DevOps – for a variety of reasons, many of the original DevOps practitioners were reluctant to even define the term, and were against a lot of the “DevOps” training/certification programs that sprung up because they weren’t really a good reflection of the real scope of the movement. While we understand those factors and agree with some of the specific critiques, we think it’s frankly been criminally difficult to learn DevOps with the available resources to date (best answer: go to a variety of events, crawl some random blogs and twitters, try to piece it together yourself over time, read some kinda-related books…). The unicorns don’t need any more than that, but all four of the Agile Admins have worked in corporate IT before and have a lot of sympathy for all the folks out there that *don’t* work for Etsy or Netflix and are trying to figure out how this new world can make their work and life better. In the course, we go into what we consider to be the three primary practice areas of DevOps – continuous delivery, infrastructure automation, and reliability engineering. lynda has a free trial period so feel free and go give it a look to see if it could help you! To give you an idea of what is included in the course, here’s the course outline. Even in a three hour class there’s no way to comprehensively cover these topics, so we tried to extensively point you out at other resources as we go and have a whole section on great DevOps learning resources. We worked long and hard on the course and we think it represents all the must-know aspects of DevOps and can get you started down the path of implementation with a good foundation. Check it out and let us know what you think! 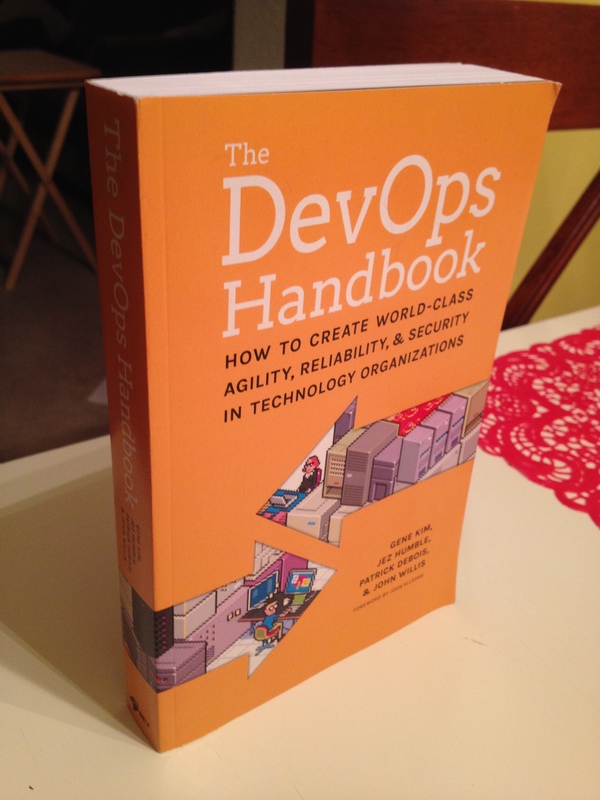 It, of course, is the new DevOps Handbook, in which luminaries Gene Kim, Patrick Debois, John Willis, John Allspaw, and Jez Humble put together a single coherent guide to understanding and implementing DevOps. Most of the “DevOps” books to date have really just nibbled around the edges of DevOps instead of addressing its entire scope head on. This book does so, and will become the standard reference in anyone’s DevOps library. Get it on Amazon or elsewhere! Joel Spolsky is a bit of an internet cause célèbre, the founder of Fog Creek Software and writer of joelonsoftware.com, an influential programming Web site. The book is about technical recruiting and retention, and even though it’s a small format, under 200 page book, it covers a lot of different topics. His focus is on hiring programmers but I think a lot of the same principles apply to hiring for systems admin/Web systems positions. Hiring has been one of the hardest parts of being a Web systems manager, so I got a lot out of the book and tried putting it into practice. Results detailed below! The first chapter talks about the relative effectiveness of programmers. We often hire programmers and pay the good ones 10% more than the bad ones. But he has actual data, drawn from a Yale professor who repeatedly teaches the same CS class and assigns the same projects, which shows something that those of us who have been in the field for a long time know – which is that the gap in achievement between the best programmers and the worst ones is a factor of ten. That’s right. In a highly controlled environment, the best programmers completed projects 3-4 times faster than the average and 10x faster than the slowest ones. (And this same relationship holds when adjusting for quality of results.) I’ve been in IT for 15 years and I can guarantee this is true. You can give the same programming task to a bunch of different programmers and get results from “Here, I did it last night” to “Oh, that’ll take three months.” He goes on to note other ways in which you can get 10 mediocre programmers that cannot achieve the same “high notes” as one good programmer. This goes to reinforce how important the programmer, as human capital, is to an organization. Next, he delves into how you find good developers. Unfortunately, the easy answers don’t work. Posting on monster.com or craigslist gets lots of hits but few keeps. Employee referrals don’t always get the best people either. How do you find people, then? He has three suggestions. “Go to the mountain” means to figure out where the smart people are that you want to hire, and go hang out there. Conferences. Organizations. Web sites. General job sites are zoos, you need venues that are more specifically spot on. Want a security guy? Post on OWASP or ISSA forums, not monster.com. We do pretty well with internships, even enhancing that with company sponsored student sourcing/class projects and a large campus recruiting program. He has some good sub-points however – like make your offers early. If you liked them as an intern, offer them a full-time job at that point for when they graduate, don’t wait. Waiting puts you into more of a competitive situation. And interns should be paid, given great work to do, and courted for the perm job during the internship. Building a community – he acknowledges that’s hard. Our company has external communities but not really for IT. For a lot of positions we should be on our our forums like fricking scavengers trying to hire people that post there.